A-Line Travel's Ford Transit that has proven to be an extremely useful (and well used!) 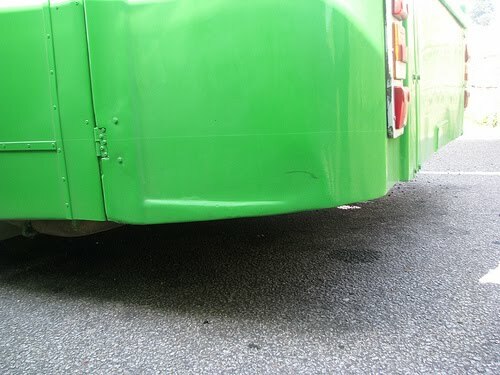 back up bus over the past few months will be ending her life at A-Line in the near future. Because of the obvious capacity issues Jim says he is after some sort of Mercedes 811. The 28 seat capacity of these is actually higher than that of the Varios. Indeed its a shame to see this little thing go, but she has proven unpopular with drivers and passengers alike. But you can't say she didn't have character, and it did bring back fond memories of the Ivecos, of course using the same engine as was used in them. 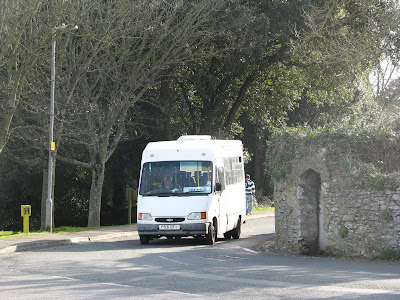 The Transit was also pretty fast, and flew round the narrow lanes with ease, so in that respect I always found journeys on her quite pleasurable. Though I'll admit, I'd have an 811 over that anyday! 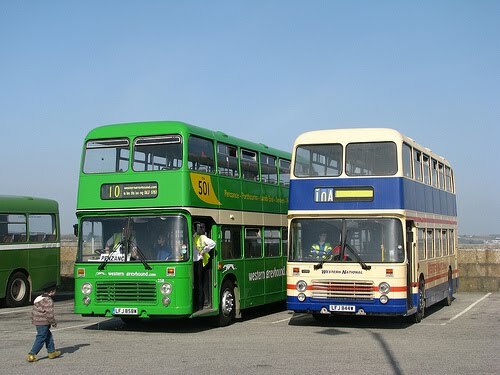 Two of the K-LAE Leyland Olympians are now going to pastures new yet again. K610 and 613 LAE spent a year if not less working on Cornwall routes, infact I don't even have a photo of 610 in service in Cornwall! And on only one occasion have I got a photo of 613! But anyway they two are now off up to First Essex. 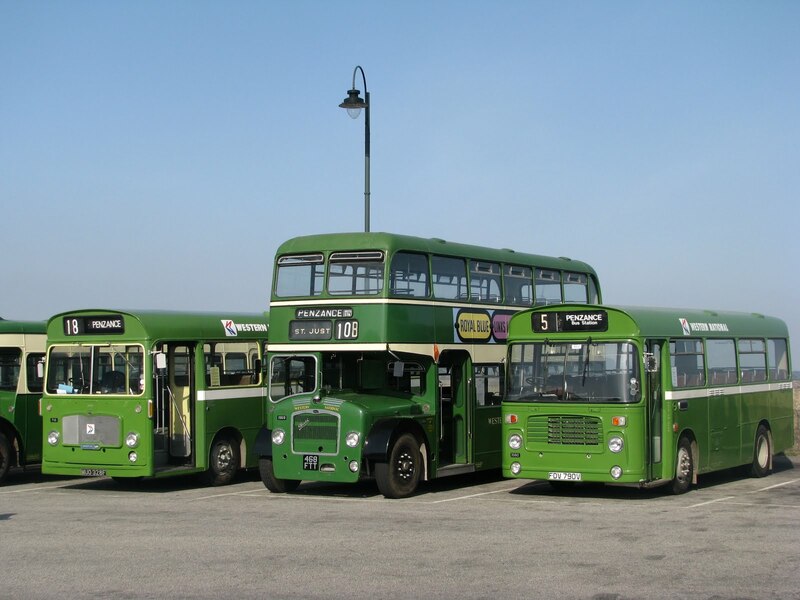 There is a rumour that the duo may be replacing the last two surviving C-HJNs in Essex, these being C415 and C418 HJN. Though both HJNs look in immaculate condition, and really have been treasured in their home country all their lives. 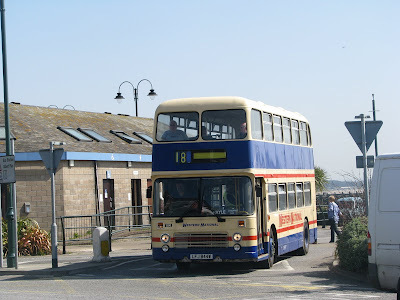 So I do hope this isn't the end for the two HJNs, though if it is, amazingly Weymouth's C414 HJN will be the final C-HJN to be still running! Yesterday saw double Volvo operation on the 34. I noted WA56 HHN sounding pretty rough that morning, so I presume she may have failed sometime in the day and therefore was replaced by F600 GVO on the full working of the 34. 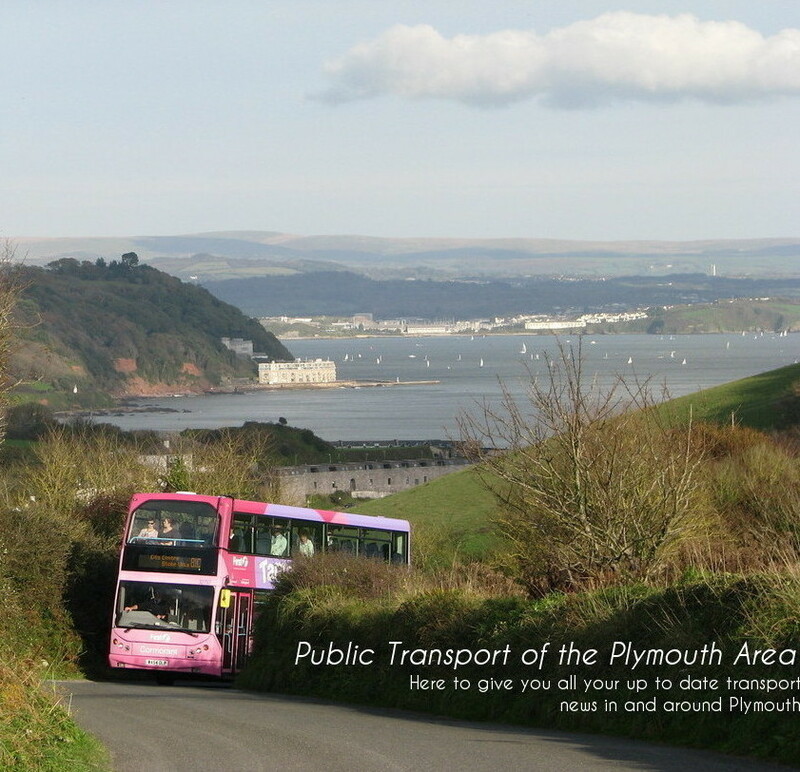 F606 GVO was standing in for the now normal, Volvo B9 on on 'short' working of the 34 just down to the Cremyll Ferry. These really are such a pleasure to ride on when compared to pretty much anything on the streets of Plymouth nowadays! In fact I can't think of anything that is still running in Plymouth that I prefer! EDIT: Sorry its not Riverlink any more is it! Riverlink has now been rebranded and Rail River Link by the Dartmouth Steam Railway and Riverboat Company. So pictured at the top very obviously is Plymouth Citybus Mercedes 709, N289 PDV still in the old livery with fleetnames removed. She had just taken over from the Vario on local service 25. Yet another company that is possibly reverting back to the faithful 709? Good to see that yet another 709 has made it into further use though! And below we have WTU 647W now named 'Molly'. All the fleet have now been given names (excluding 289 at the moment) which I've always felt is a nice touch and makes the fleet that bit more friendly and personal. Much like 'Dennis Dart' though saying "I want on Dennis Dart today" doesn't really narrow it down very much! This week's Snap on Sunday is of Hookways L948 CRU which I rode on exactly a year ago today from Exeter to Okehampton. Of course this was before Western Greyhound took over these X90 journeys and coaches were used on the route, running right along the duel carriageways rather than along smaller roads. 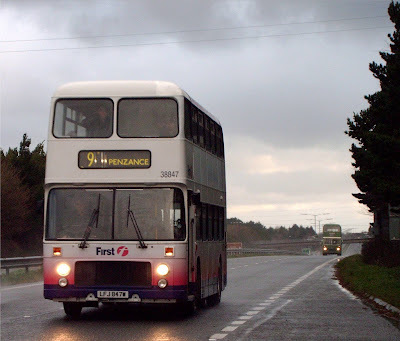 I remember vividly it raining very hard while myself and Louis were waiting for a bus in Exeter but decided to let FDC's Enviro 400 go, so that we could have a ride on the coach! A decision well made seeing that nearly all journeys to Okehampton are now Enviro operated. 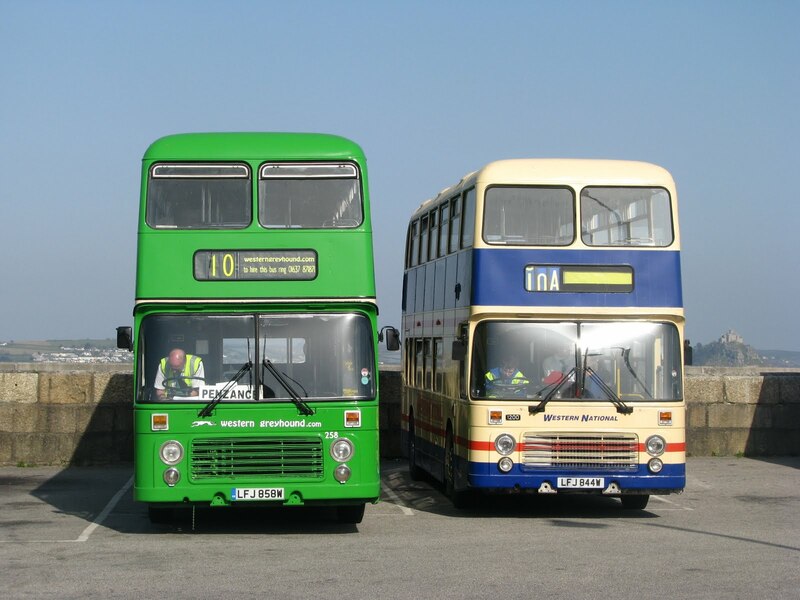 Seeing as we're still on the topic of Penzance as well as ferrybuses here are two Ex-Ferrybuses pictured together on the 9th December 2006, of course the last 'official' day of operation of the closed top VR with FDC. 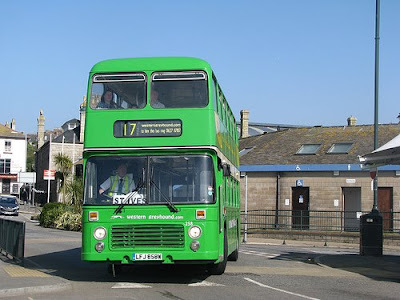 As many of you will know, VR operation did actually continue another week where the last VRs worked some Mousehole Park and Ride services if memory serves. 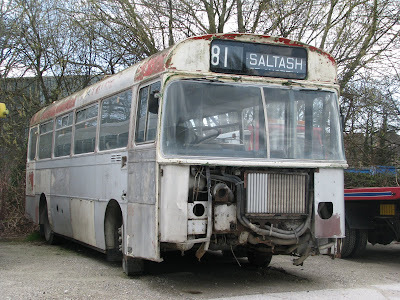 LFJ 847W hasn't been on the rally circle for a while now, but is still stored at Loddiswell. OTA is also stored at Loddiswell along with LFJ 844W. It would be nice to see the two LFJs return but personally I have no idea when this may be! This lovely little LH made her first trip to Penzance since this 80s this weekend! She drove superbly and really was a credit to the owner. She looks fantastic and went even better! New seats for the S reg! Two smaller posts for today because both aren't really that interesting! Torpoint's original Dennis Dart, 40002 has finally been completely re-moquetted after it was partly done a while ago. All the seats are now in the 'old' new moquette. Of course the new First Group moquette can be seen on the new '09' Enviro 200s now running about. I never realised how pretty vapour trains could actually be! Taken yesterday morning on the phone in Devonport, several trails can be seen criss crossing each other. Appears to have been quite a lot of air movement early on! Come to think of it, this is the closest I've ever come to plane news! 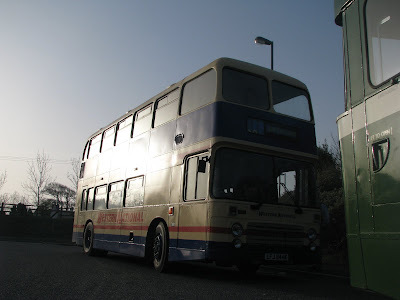 As promised today’s rally focus will be on Mark Howarth’s newest acquisition, Ex-Western National LFJ 858W. She was recently bought by Mark from Emblings, of course well known for keeping quite a sizeable amount of VRs going, and luckily Mark heard 858 would be going, and managed to buy her for preservation. Over the last few months restoration has begun and she is now looking superb. She is now painted in Western Greyhound’s double deck livery, similar to the route branding that is on the ‘510’ branded Enviro 400s. 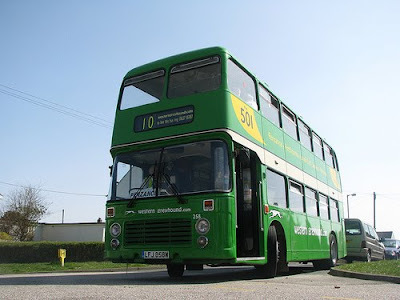 She has been put into WGL’s ‘501’ livery, and advertised as ‘A heritage bus on a heritage route’. 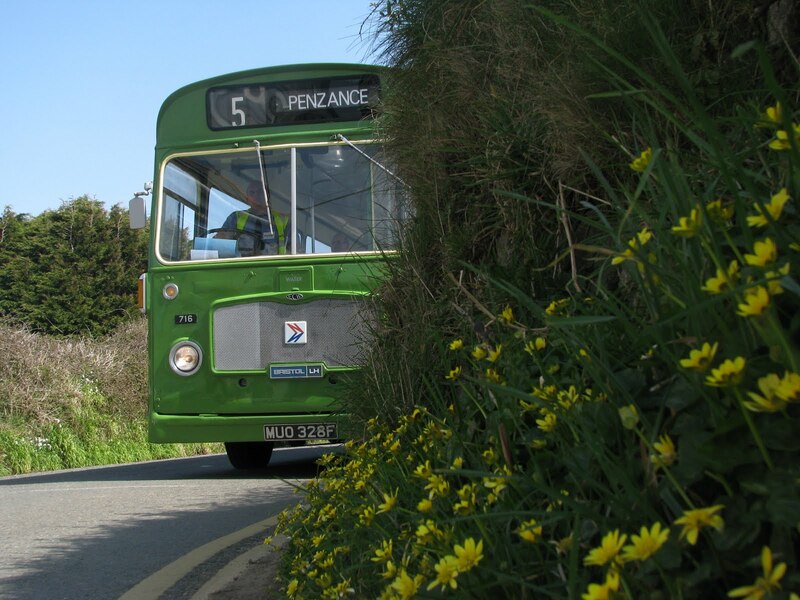 So as you have guessed, she will indeed be in service this year on the new 501 between Penzance and Lands End. 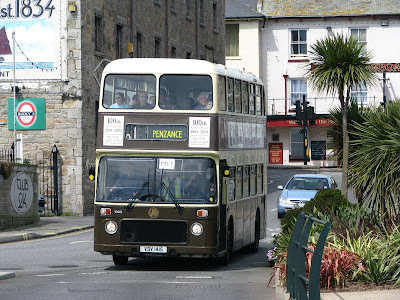 Its great to hear that a VR will be returning to Penzance on a regular basis after nearly three years since FDC got rid of their last open top VR. Indeed I feared that Cornwall may be without service VRs this year, after the withdrawal of Enterprise Boat’s VR. Also interesting to note (on the bottom photo) is that Mark has chopped off part of the rear engine cover. Reason? So she can be taken on the Torpoint Ferry! I very much looking forward to seeing a VR on the ferry again. Its amazingly now been 4 years since LFJ 844W last sailed across the water, and even worse, I only ever took one photo of a VR on the ferry! Anyway back to the actual point of this post I only managed one trip on 858 unfortunately but indeed she is a fantastic example of the VR. She sounded glorious on the run, and indeed even though she’d been used on school runs the interior was in very good condition. 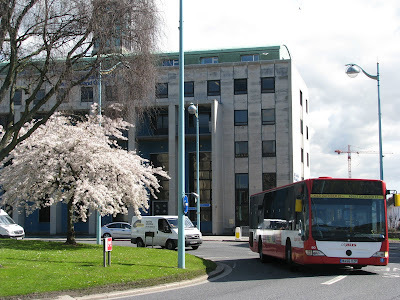 I very much am looking forward to riding on the bus later in the Summer and the bus really is a credit to Western Greyhound. Well instead of doing one mammoth post I have decided to cover the rally in stages. 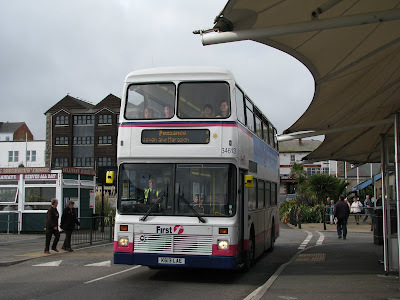 So to start off is the bus I spent easily the longest amount of time on, on Sunday, LFJ 844W. Of course this bus has always been close to my heart seeing as she was the last VR to operate at Torpoint. 844 had always been my favorite and I was so glad that she passed into preservation. So here she is on her first outing of the year. I picked up the trip at Milehouse with my associates for the day before steaming down the A38 to Liskeard where we joined VOD 124K and VDV 760. VOD blasted off ahead while 844 and 760 convoyed all the way down to Penzance. 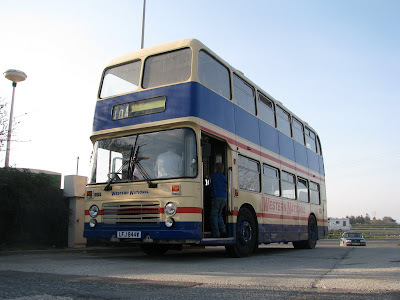 Around three hours later we arrived while 844 had a break, and met up with sister bus LFJ 858W, now owned by Mark Howarth (Western Greyhound) which will feature in a post tomorrow. I don't believe the two would have ever met up in their working lives even though they are numbered closely. They were both based in very different areas. 844 then took a rest, before running three services in the day. I then joined her for the run back upto Plymouth. Really is a fantastic bus and so thank you to the drivers and owners of the bus for the trip. The journey would have been a lot more difficult without them! Finally after all this time I have got a photo of 57000, the sole Plaxton Primo. 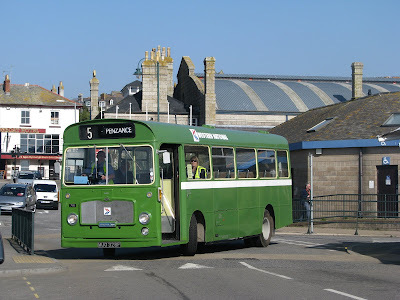 She was back on the roads of Plymouth today operating what I believe was a service 6 (? ), but had just got onto a dead trip back to the depot, in the hands of Roger Pinder! Of course as I've mensioned before Roger used to drive for Tally Ho! and I worked with him doing restoration at Loddiswell for WHOTT. But now his carear is in Plymouth and I hope to have a catch up with him soon! He gave me a nice little toot while going through the centre today. Just a quick one today, apologises for this not being done for 7:00 today but unfortunately I had no computer access. 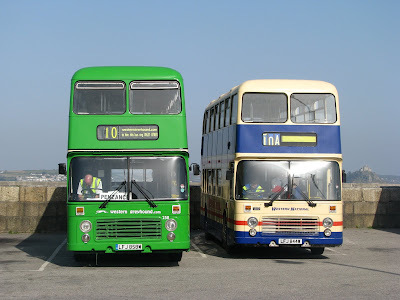 Of course today was the 3rd Penzance Running Day organised by the CBPG, and what a fantastic day its been. 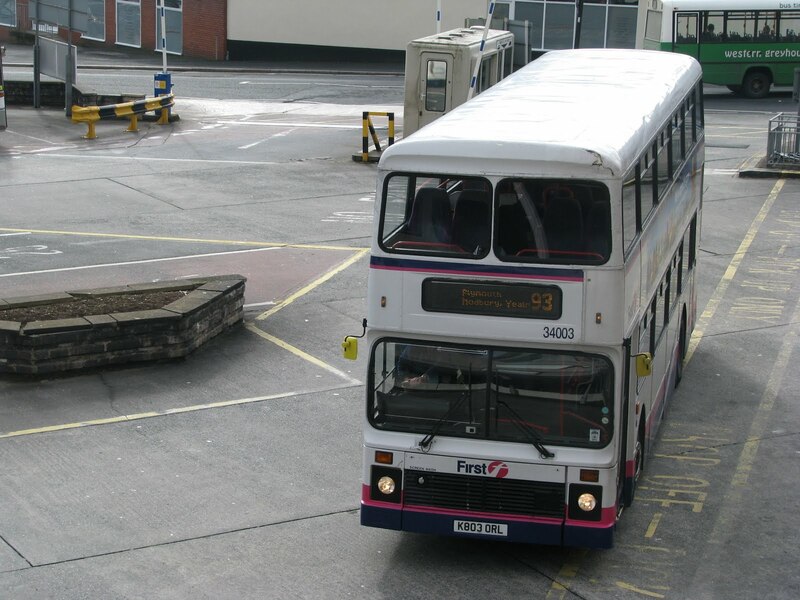 A full write up will come later on, but I have chosen this photo of Bristol LH MUO 328F. 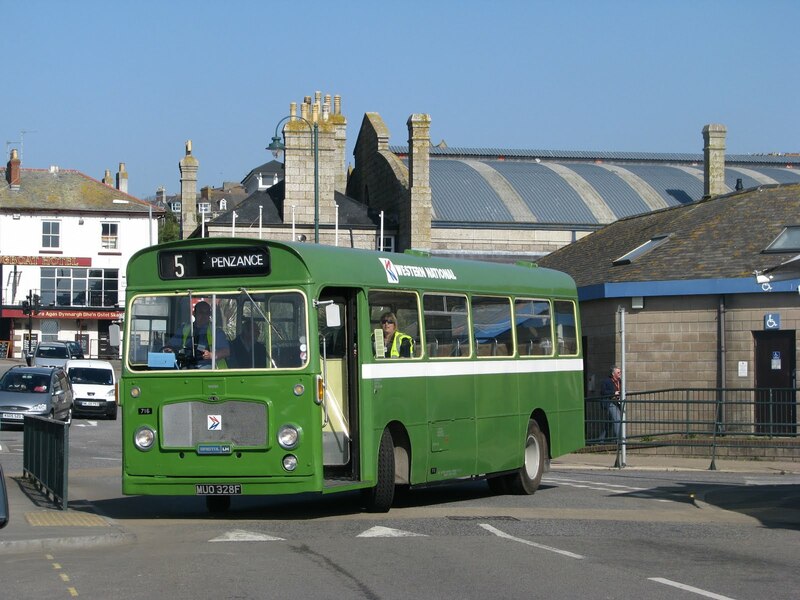 This was her first visit back in Penzance after some 29 years away from the area! A fantastic little bus. With the persistent lack of news today we have the 'Station Sign Saga' in a theme in which myself and David Sheppard (well mainly David) are doing. 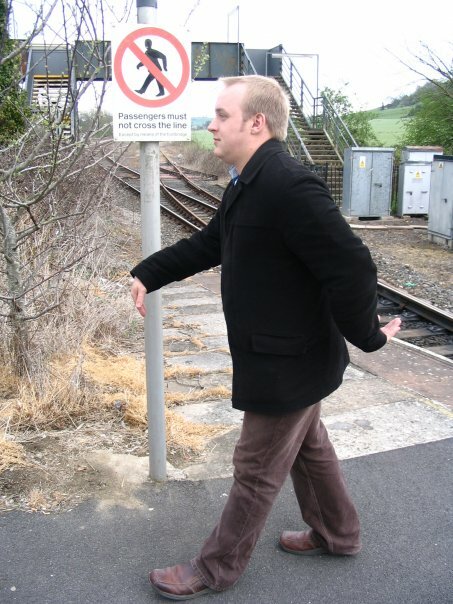 As we travel around the rail network, we have been posing with the various warning signs, and really, try to make a mockery of them! So here are the 1st three! If you want to be features in 'SSS' then please do e-mail it along to ptotpa@hotmail.com! Because news is so thin on the ground at the moment I've decided to take a look back and transport you to April 16th 2008, exactly two years ago. Its quite amazing to think how much has changed in this short time, and yet the two years has also flown by! The Olympians were on this day, very much in their prime. I photographed all but C412 on this day two years ago. 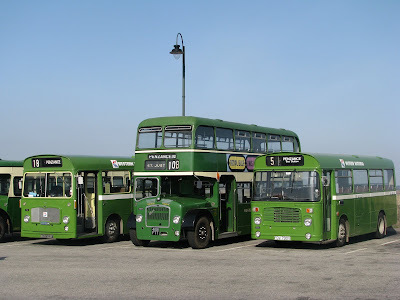 Though really, it seemed quite rare that all 4 ran in service together on each day! This photo is also one I've been reluctant to use. It would have been a pretty nice photo of C413, apart from the fact that we have these pedestrians walking straight through the bus station in areas you 'shouldn't' walk on. Yes I must admit I and many other's do this to take photographs of what's lined up along the wall etc, but simply to walk straight through it all, seems nearly pointless, for the sake of saving 15 odd seconds? The presence of the '09' Enviros is now very much being felt on the streets of Plymouth. 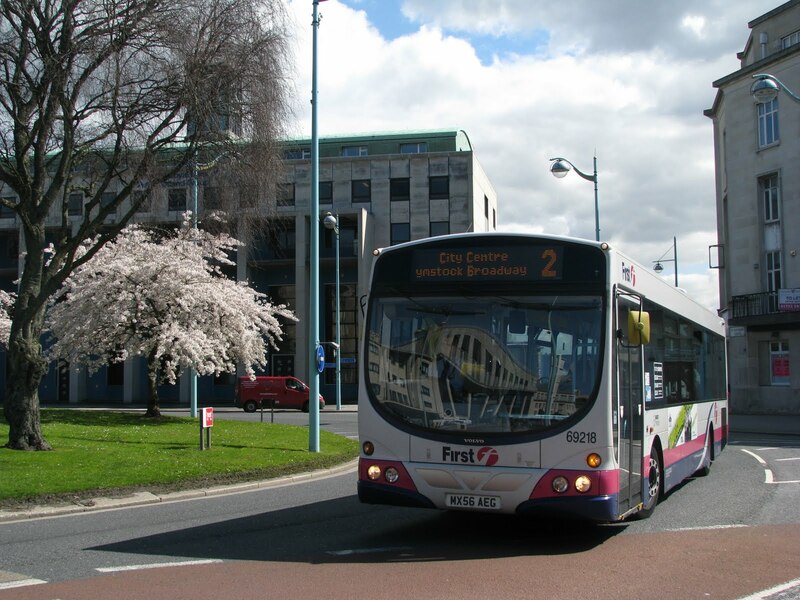 They've been on all sorts of routes rather than just the newer competition routes, like pictured here with YX09 AGZ on the 3. One annoying thing I've found about them though is its half impossible to read the fleet number especially when travelling at speed. They're stuffed right in the corner and are pretty small. But there we go! I've yet to have a ride on them, but according to reports I've had they "Go like f***!" I have now found out the reason for the B7s being transferred upto Glasgow thanks to Louis Rawlings. From what he's heard the company that used to do a competing service with First Glasgow have "gone bust" and therefore FDC were left to do it all by themselves. 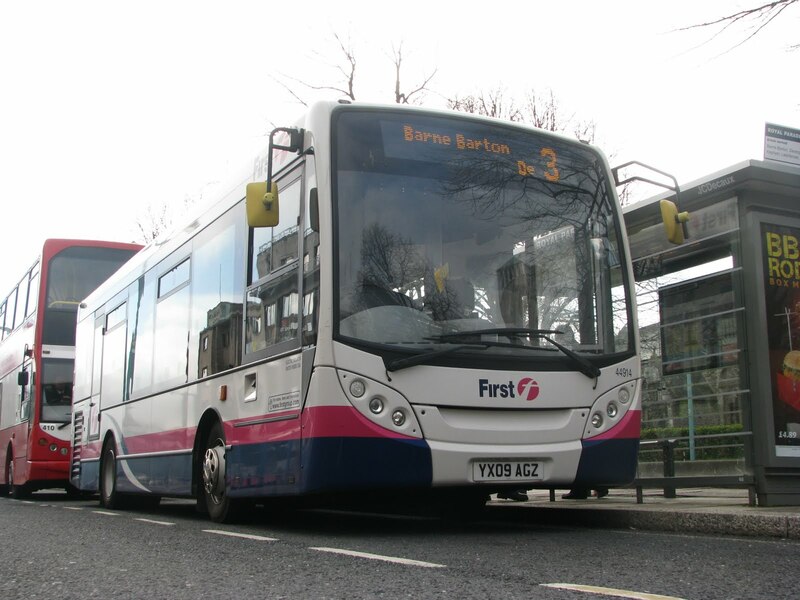 This therefore meant the Enviros couldn't cope with the effectively two bus loads and therefore the B7s were drafted in to increase capacity! 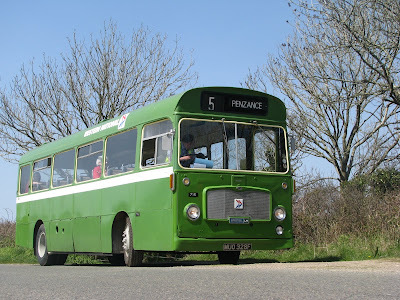 Good news to report today is that 'Bertie', R651 YCR is finally back on the road after quite a lengthy spell out of service due to electrical problems. She has been running fine in service over the past few days. I would say she's been giving a nice ride but well, its a Vario, I have nothing more to say! Indeed it must be the longest amount of time i've avoided riding on Varios, something i see as a positive. Its nice to have something different for a change! 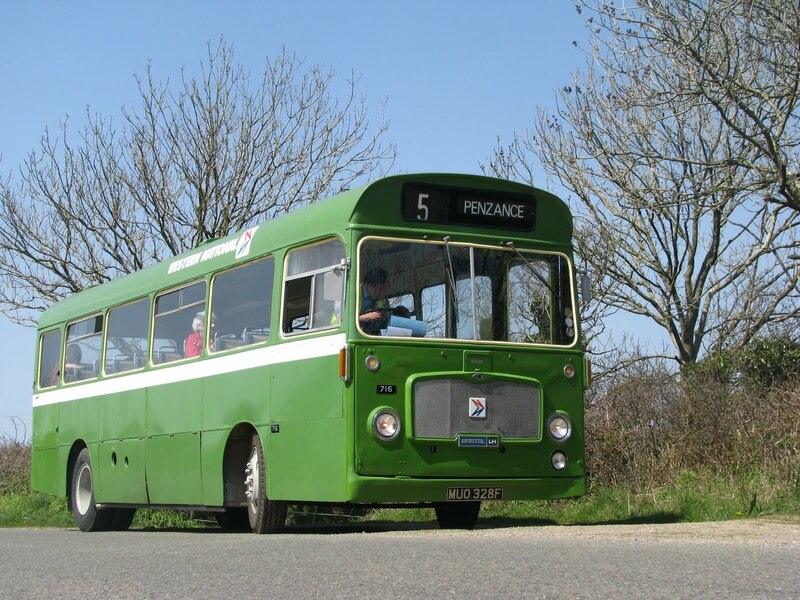 This Sunday will see the 3rd Penzance bus rally taking place this year organised by the Cornwall Bus Preservation Group (CBRG) . So far there are 12 entries for the rally with a wide range of vehicles on offer. This will hopefully see the first appearance of A754 VAF in preservation, as well as a large number of VRs, with LHs, SUs, an LW, an MW and an FLF in the mix as well. Penzance is always a rally I very much look forward to, and this year it sounds like it won't disappoint! 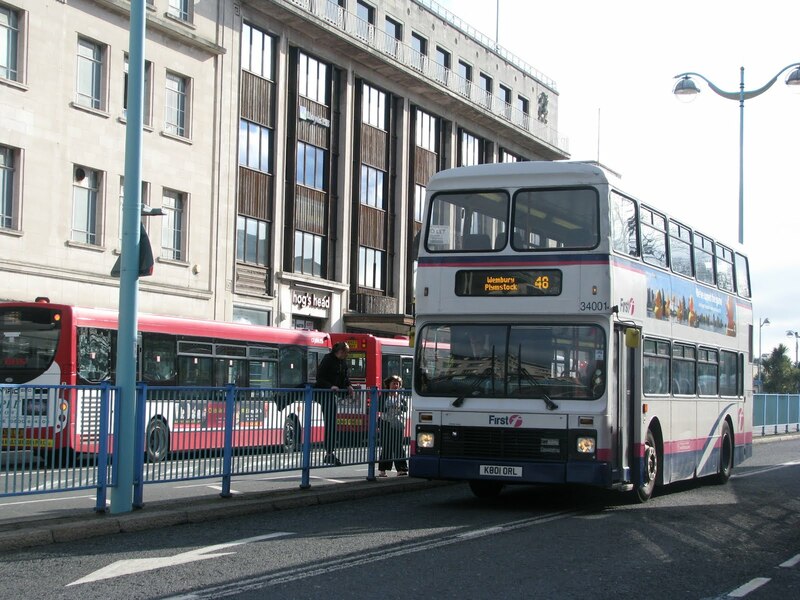 Many of you will remember this from the Plymouth scene. 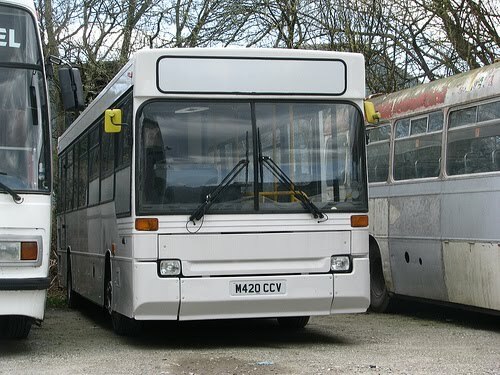 This is Ex-First Devon and Cornwall Dennis Dart, M420 CCV, which was at work in Plymouth right at the end of its life. 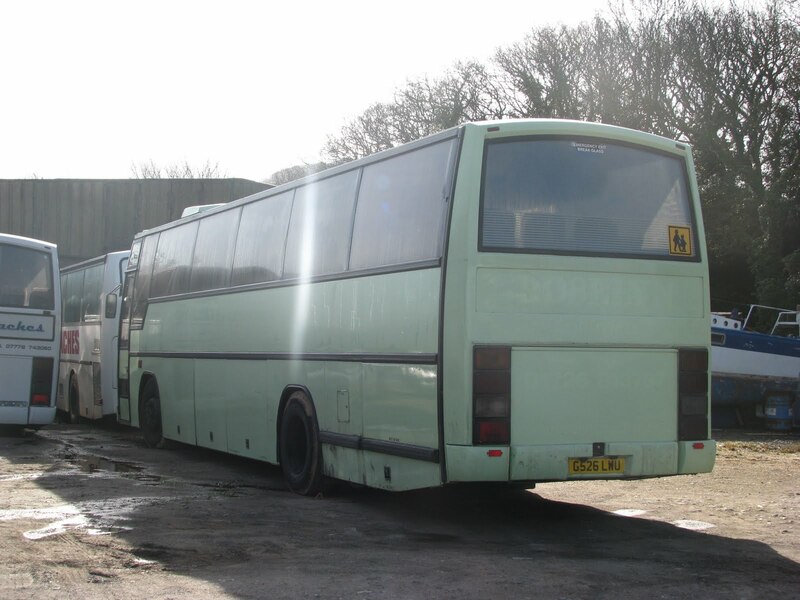 She is now owned by Plymouth Argyle, and stored here at Target Travel's Plympton depot. Not sure what she is used for if I'm honest but I suspect its supporter transport in some way or another. Anyway its nice to see she's survived and is indeed looking very smart, even if a bit bland! Firstly I apologise for the late running of this blog! I'll admit it was my fault this time, I put the date to the 12th rather than the 11th! For the Snap on Sunday this week it was quite a hard decision simply because none of the photos really stood out, and all had their slight imperfections. But I have settled for these two. Both as is quite easy to see were taken at the top of Royal Parade, trying to include the blossom on the tree. That street lamp is surprisingly annoying when it comes to getting picturesque shots on the roundabout. So to combat this I went further round the roundabout to this location. The street lamp has gone, but now we face another problem, the dreaded shadow! After this I gave up and went to an 'easier' spot! Well she may not be looking as happy as she once was, but at least she's safe! 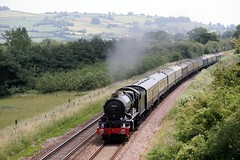 NFJ 592M survives after I feared something had happened, after she disappeared from her spot at the South Devon Railway! She is now back in Plymouth, but living in the Plympton Target Travel depot. 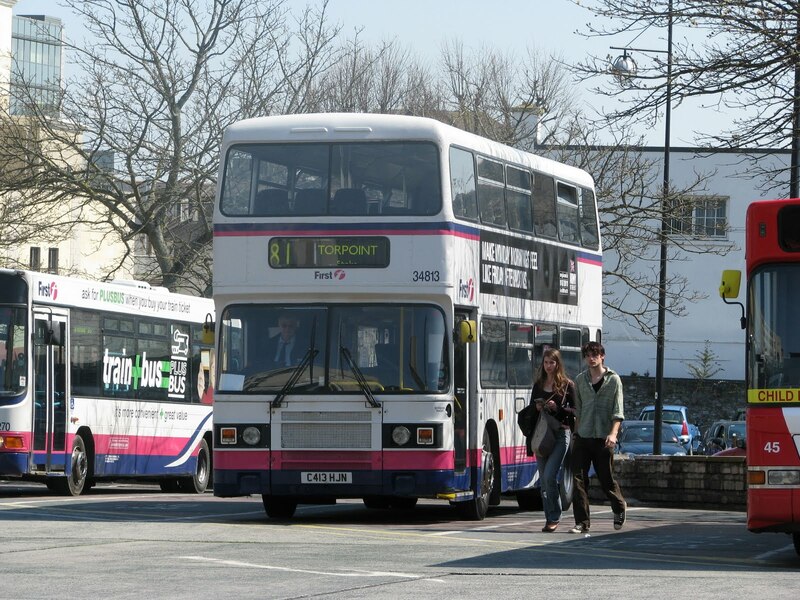 Of course as many of you will know NFJ was bought new by Western National to run Torpoint routes, but was only based at the depot for 9 years. 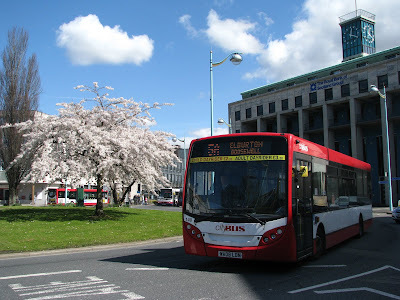 Ridership had grown and VRs needed to be introduced, so she was moved into Plymouth to run Plymouth Citybus' new rural routes under the 'Plymouth Countrybus' fleet name. In this short period she also worked in Swindon when on loan to Thamesdown Transport. She then passed to Emerald Ambassadors Marching Band for their personal use. This could have been the end but Woods Brothers of Buckfastleigh stepped in to buy her for school contract work, but ended her working life in 2000. Luckily before falling into dis-repair David Fricker and James Pratt spotted her and brought her into the preservation circle. No mechanical work needed to be carried out, and after the bodywork had been tidyed up she was ready to rally in 2001 and indeed was! Though this is where the story takes a turn for the worst. NFJ then was bought by Ralph Delbridge, who hoped to paint her into NBC leaf green for the 2002 rally season. Instead she was stored at the SDR, and remained there for some 7-8 years in outside storage. I pictured her at the SDR in 2007 on the blog, and three years later something positive is happening! She looks to have had some work done to her already, the front panel was not sighted so could mean it was either in dis-repair, but hopefully being touched up! I would like to try and find who does own her now, or indeed whether it is still Ralph Delbridge. So if anyone knows more than I do then please feel free to comment on the post. Great to see that there is finally light at the end of the tunnel, for this fantastic little bus. 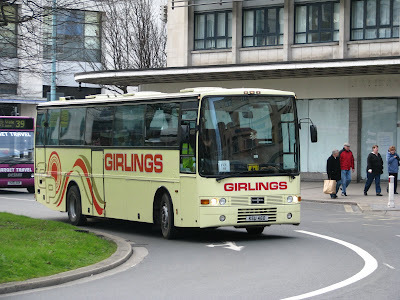 Some great news to report on is that A-Line have now acquired a new coach, this being G526 LWU. She was formerly Roselyn's KSU 454 (though several buses ran under this registration) and was picked up from Girling's depot yesterday. Indeed as its plain to see this coach is a cut above the rest of the fleet. I saw no hints of rust coming through, and the panelwork was dent-less! 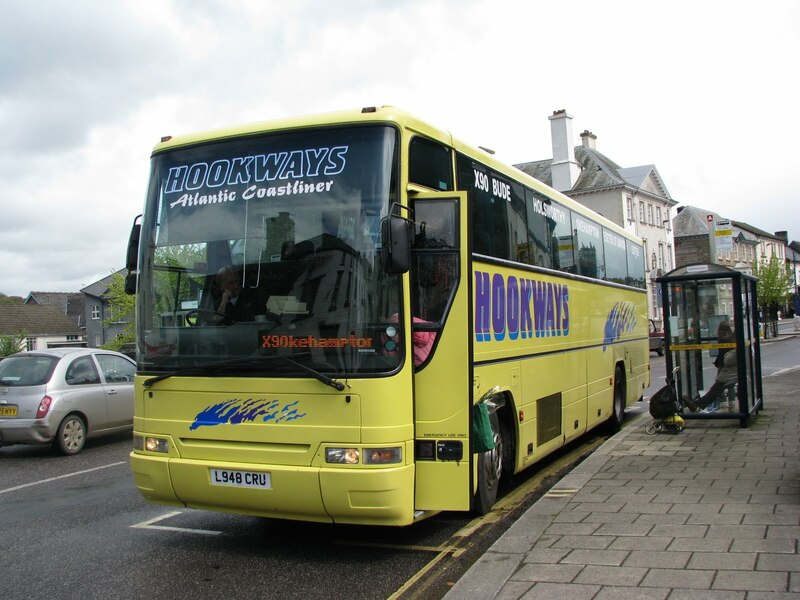 Amazing to think on a 21 year old coach - though of course Roselyn have always kept their fleet to a very high standard. After a bit of research I've found that G526 was just one of a large batch new to Wallace Arnold in 1989. She began life working in Leeds with her 26 sisters based there. Ironically around 20 more from the same batch were based in Paignton. 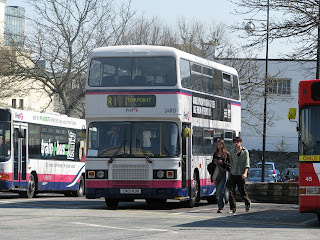 Strangely though it wasn't the Paignton lot that have continued in service and amazingly Western National operated G521 LWU for a while from Plymouth, on longer distance services, including the 76. So she definitely has some local roots, and hopefully she's continue many more happy years in service in the South West. Unfortunately its not all good news though. The Scania JIL 3755 will likely face the scrap man in the near future. Persisting problems with the fuel bug have forced this decision and though she is lovely mechanically, its no good trying to run an unreliable bus in service! Torpoint's Olympians were running all over the place yesterday. As picture K801 was on the 48s, running to Wembury, even though they said double deckers won't be used on the 48 any longer! K802 was the only Olympian actually on Torpoint services. K803 was on 93s to Dartmouth, and K804 was idle all day. Fair enough these buses aren't route branded but come on! I want them in Torpoint! K802 was on 3s yesterday out to Barne Barton, really I'll simply say, lucky them! 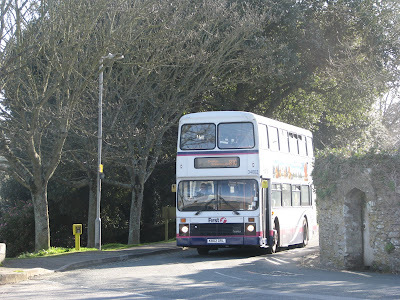 Indeed on the subject of this I always used to use the 08:45 service from Cawsand, simply because it was a guaranteed Olympian. Recently though its become yet another Trident operated service and Olympians could be on pretty much anything! I was very lucky today in the fact that while waiting for my bus home this came along! My first spot of one of these '09' reg Enviros in service and I must admit they do stand out on the streets of Plymouth. I nearly let it go by thinking it was the Ex-Truronian example but luckily I was quick enough to get it zooming down Royal Parade. Strangely this was operating a 2. While in Royal Parade I saw many of the S reg Darts on the newer Ugo routes so they don't seem to be sticking to these like the B7s have been! But then again, its only the first day! Well for the first time on Saturday The L and L show carried out their first 'broadcast' with the main theme of The Royal Duchy railtour with D1015, Oliver Cromwell and 44871 (A Black 5). You can now listen to the show on youtube and all the parts can be viewed below. Hope you enjoy and please feel free to give feedback on the show. Today's Snap on Sunday is of one of the Ex-London Volvos that Plymouth Citybus have recently acquired. 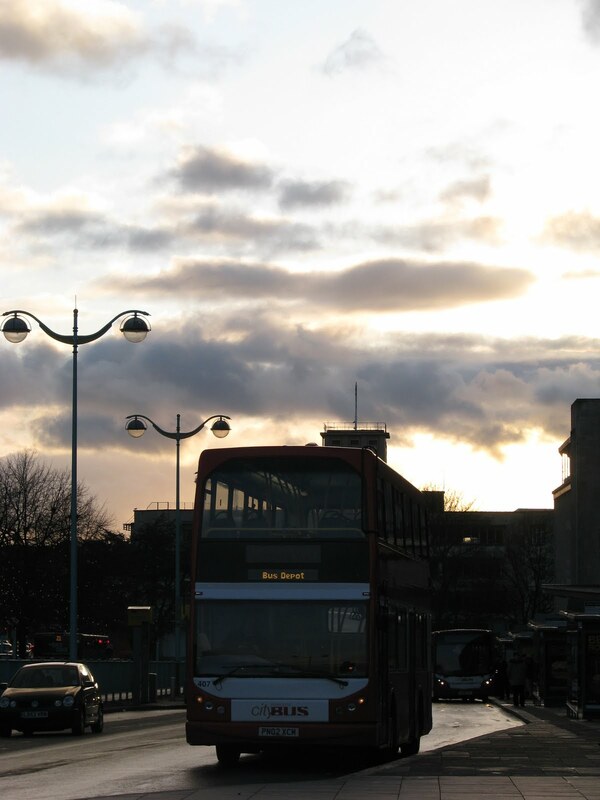 PN02 XCM is seen here yesterday evening on Royal Parade after finishing a day's work on the 26. With thanks to Anthony I can bring you this great photo of the first glimpse of the new Enterprise Boats shuttle bus! This is a Northern Counties bodied Leyland Olympian new to Stagecoach and is registration K660 UNH. Yes I know right now this seems one of the least interesting things in Cornwall - infact K reg Olympians are the norm, though no doubt in 10 years time we'll be all over it, much like the Series 2 VR before. Though really can anything ever 'replace' a VR? I think not! So there we have it. PTOTPA - for the first time has managed to bring you the news every day for a month. Something really I never thought possible, but putting my mind to it in fact it has come all too easy. Once I got into the 'rhythm' of blogging at a certain time every day the words just fell into place and stories could be delivered to you at 7:00am every morning. Or maybe this is a cover up and March was just an ironically good month for news in the area! I've taken much of my inspiration on this from Omnibuses who do blog every morning. Of course the posts they deliver are of far higher quality, and really there simply isn't the news to be able to write things like that every day in Plymouth. True as you may have noticed on some days I went away from the local scene, simply so I could get the day's post in without missing it! So anyway thanks again for your support to the blog and maybe PTOTPA can give another month of daily blogging through April! So to today's news Saturday (tomorrow) is what I'll describe as the first 'proper' railtour of the year, this being a double header with Tangmere and Sir Lamiel on the run down from Bristol to Penzance. 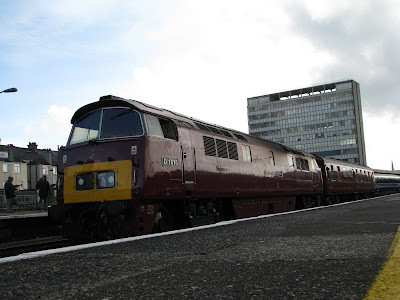 Then on the return trip as well as the London to Bristol section will be pulled by D1015 - Western Champion. For anyone who would like to go down and have a look these are the timings published on the website. Not terribly helpful but I may be able to add some more detail if it becomes available! 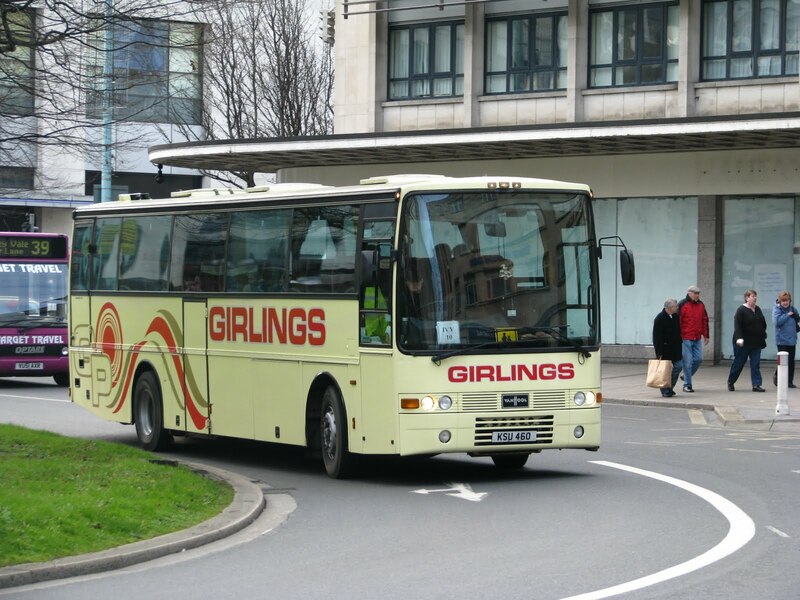 A-Line Travel manager Jim Goodard will be going to Girlings (now part of Roselyn) tomorrow to have a look at a few coaches that are currently for sale. 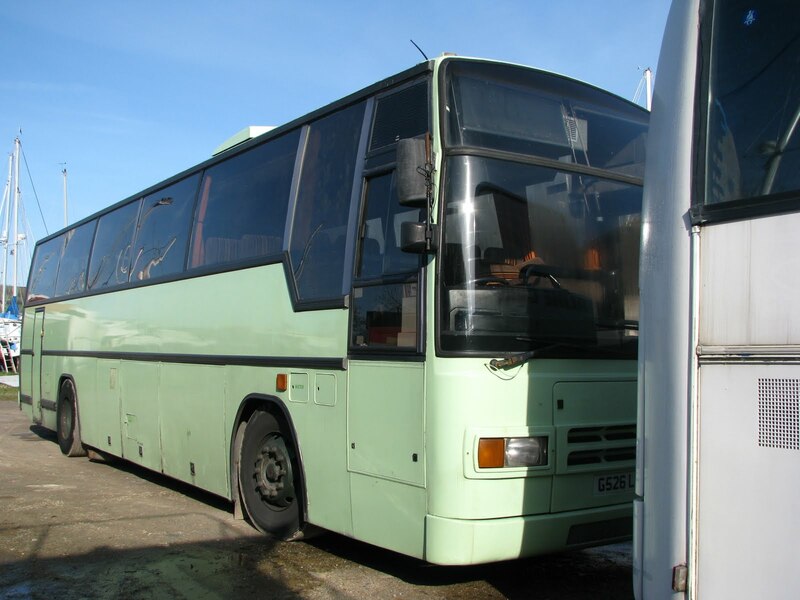 I have no idea which they may be, but one will replace JIL 3755, the Van Hool bodied Scania. Shame as the Scania has a great engine in her, though other issues have meant she has not left the depot for some months now.